James Henry McKnight was born on March 19, 1884 at Brownsville, Fayette County, PA, the son of Henry and Martha (Nutt) McKnight. On March 20, 1905, a day after his 19th birthday, he married 22-year-old Nora Victor (1883-1961), daughter of Davis and Dorothy (Swaney) Victor of Fairchance, Fayette County. She was a year older than her husband. The McKnights went on to produce seven children -- Dorothy Spaw, Martha Bush, Margaret Anna Garletts, Phillip Davis McKnight, George Swaney McKnight, Laura Edna Radcliffe and Lela Kathryn Cyphert. Sadly, their son Phillip died at birth. Nora is seen here with their twin daughters Dorothy and Martha. James was a longtime farmer and coal miner. Working with his father in law Davis Victor in 1909, they were injured in an accident at the Cyrilla No. 2 Mine in Fayette County. The 1909 publication Report of the Department of Mines of Pennsylvania reports that each man's "Face and hands [were] burned by the ignition of coal dust from a blast of dynamite blowing through a rib between two entries." Well my dear boy I surley was glad to get your letter. I am not vary well this Spring and Summer but able to work. We have had so many to cook for. There was lots of berries and lots of people... There is hard times every place so Gimmy come home and stay with me. I don't often hear anything of your people... May God bless you and take care of you and I pray for you always. From your Momma to my dear boy. On vacation in the early 1930s, James began to keep company with a woman from Brownsville. A newspaper described her as "a comely widow." Nora pursued legal action in Fayette County Court, with James ordered to make monthly alimony payments of $30 plus furnish a $1,000 bond or otherwise face jail. He counter-argued that he had returned to his wife in Fairchance, but then left when Nora refused to terminate the bond. James' married daughter Margaret Garletts, said the Uniontown Morning Herald, "advised him he better leave the county before he was driven out... [but that ] he came back at the request of his brother, Frank, of Jefferson township, who went his bond and who had been paying most of the early alimony." James and his lady friend eventually moved to Chicago, where he "boarded" in her residence and found employment in a local tin mill. When James' mother died in 1938, some five years later, her newspaper obituary reported that James was still residing in Chicago. It's not known when he returned to Western Pennsylvania for good. In 1944, sadness struck the family when their eldest daughter Dorothy -- who had married Harry Spaw -- died of a brain tumor at age 38. She was laid to rest in Fairchance. James and Nora never reconciled. She died in Fairchance on June 28, 1961, at the age of 78. James died at the age of 77, in the home of their daughter Margaret Garletts in Fairchance on March 7, 1963. He is buried in nearby Maple Grove Cemetery. His obituary in the Uniontown Evening Standard said he was survived by 18 grandchildren and 10 great-grandchildren. Early view of Fairchance's Church Street. Note the ever-present mountains in the background. Daughter Martha McKnight (1906-1978) was born on Feb. 15, 1906. On Sept. 4, 1926, at the age of 20, she married John H. Bush Sr. They had three children -- John Bush Jr., Audrey J. Seman and Robert V. Bush. 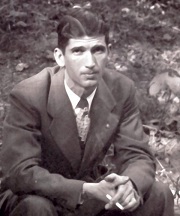 John Sr. was a coal miner at Jones & Laughlin's Richeyville mine from about 1930 to 1966. 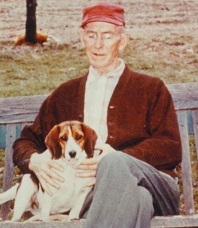 Circa 1927, their home was at Chewtown, and in 1963 was in Centerville, Washington County, PA. They were members of the Richeyville Community Church, and made their home in the 1970s at 917 Old National Pike in Brownsville. Martha and John celebrated their 50th wedding anniversary on Sept. 4, 1976. Martha died at the age of 72 in August 1978. Son John Bush Jr. (1927-2004) was born on June 17, 1927 at Chewtown. He served in the U.S. Navy in World War II in the Pacific Theatre of action. 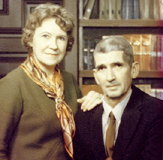 Upon his safe return home, he married Patricia Staley (1931-2010), the daughter of Byron E. and Myrtle E. (Wheeler) Staley. Their wedding took place on Sept. 17, 1948. Their four children were Cheryl Ann Torma, John E. Bush, David R. Bush and Perry D. Bush. The Bushes made their home in Kinsman, OH, at 8586 Main Street. John "retired from the former Sharon Steel Corp.'s Farrell Plant," said a newspaper, "where he was employed for 38 years in the Plant Protection Department. Mr. Bush attended Pymatuning Community Church in Andover, OH. He enjoyed gardening, farming and reading his Bible." John died at age 76 on Feb. 5, 2004, at UPMC Horizon in Greenville, PA. At the time he was survived by 12 grandchildren and eight great-grandchildren. Patricia outlived her husband by six years, and suffered at the 2009 death of her grandson Charles J. Bush. She passed away at the age of 79 on Sept. 21, 2010. Son Robert Victor Bush (1930- ? ) was born in 1930. His first wife was Ellen Pat (?) and they had five children -- Robert "Robbie" Bush, Alan Patrick "A.J." Bush, Carol Fagan, Nancy Baune and John Bush. They made their home in Hawthorne, CA. Sadly, Ellen passed away and Robert married again, to JoAnn (?). Grandson Alan Patrick "A.J." Bush (1956-2013) was an Eagle Scout who served in the U.S. Air Force in the Panama Canal Zone. He was employed at Rockwell International in El Segundo, CA and at Home Depot in Torrance, CA. Among his hobbies were traveling to Mexico, surfing, darts and pool. He died at the age of 56 on Jan. 25, 2013 in Harbor City, CA. Daughter Audrey Jean Bush (1935-2013) was born on Feb. 7, 1935. She was twice married. Her first spouse was Ben Capozza ( ? - ? ). Later, she was wedded to John Seman ( ? - ? ). After obtaining her bachelor's degree from California University of Pennsylvania, she taught for a decade in Washington, PA (1961-1972), followed by assignments in Ohio, Mississippi and Alaska. She has contributed to our knowledge of the family. See her more complete entry in our "A Sense of Wonder" webpage honoring many hundreds of cousin-educators in our family. She died in Copper Center, AK on March 8, 2013 at the age of 78. Daughter Margaret Anna "Peg" McKnight (1908-1979) was born on Oct. 5, 1908. She married Grant Alfred Garletts ( ? -1972). They lived on High Street in Fairchance and had four children -- Terry G. Garletts, Patricia Bowers, Nancy Eberly and Linda Baker. Grant was a longtime railroader and a member of Trinity Methodist Church in Fairchance. Margaret "was a member of the Trinity Methodist Church, Fairchance, and a retired employee of the Monongahela Railroad," said the Uniontown Morning Herald. After Margaret's estranged father returned to Western Pennsylvania, and was nearing the end of his life, he made his home with Margaret and Grant. He died in their residence, on High Street in Fairchance, in 1963. Grant passed away in 1972. Margaret outlived him by seven years, and lived in their home at 39 High Street in Fairchance. She died at age 70, on Feb. 9, 1979, in Uniontown Hospital. She is buried at Maple Grove Cemetery in Fairchance. Son Terry G. Garletts (1941-2008) was born on April 21, 1941 in Uniontown. He wed Anna Marie Check in about 1964, and they were married for 44 years. They had one son -- David Grant Garletts. Terry "was employed at the USX Clairton Coke works for many years until his retirement, " said the Uniontown Herald Standard. He "attended the Trinity United Methodist Church of Fairchance." Terry passed away at the age of 66 in Uniontown Hospital. Burial was in Maple Grove Cemetery in Fairchance. 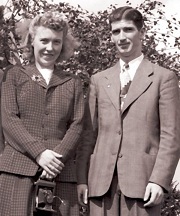 Daughter Patricia Garletts married William Bowers. Circa 1979-2013, she lived in Greenville, SC. Daughter Nancy Garletts married Ralph Gilbert Eberly. Circa 2008-2013 they resided in Pittsburgh. Daughter Linda Garletts (10943-2013) was born Jan. 31, 1943 in Fairchance. She wed Lewis "Jim" Baker (1940-2014), son of Emmett and Edith (Nascimben) Baker of Uniontown. They lived in Fairchance and had two children -- Jamie Baker and Christopher Baker. Linda worked for many years as a certified prosthetic fitter and stylist with Serpento Pharmacy in New Salem, near Uniontown, and later with Hixenbaugh Pharmacy in Uniontown. She also was active in volunteering her time for 11 years with the American Cancer Society's "Look Good, Feel Better" outreach to women with cancer, and was a member of the Trinity United Methodist church and Fairchance Free Methodist Church. Jim worked for many years with the Boilermakers Local 154, of which he was a member. Suffering from a massive stroke, she died at age 70 on Aug. 19, 2013, terminating a marriage of 48 years. Interment was in Maple Grove Cemetery in Fairchance. Jim only survived his wife by a little more than seven months. He passed away at agre 73 on March 29, 2014. Son George Swaney McKnight (1915-1974) was born on June 15, 1915. George lived in Queensland, Australia during the 1940s, and served in the Pacific Theatre during World War II and the Korean War. He was married twice. His first wife was Moya Jorgenson (1923-2014), daughter of Dale and Rose (Nelmes) Jorgenson of Cooray, Queensland, Australia. They had two children, both born in Queensland -- Adrienne Rose Green and Daniel George McKnight. Upon moving to the United States, Moya became "bitterly homesick" but her "sense of adventure won out," said the Las Vegas Review Journal. After a divorce, George made his home circa 1963 in Temple, TX. Moya settled in Las Vegas circa 1963, and married twice more, first to (?) Salisbury, and then to (?) DePonceau. George passed away at the age of 58 in the Veterans' Hospital in Temple on April 26, 1974, at the age of 58. His remains were returned to Fairchance for burial in the Maple Grove Cemetery, in a funeral led by Rev. Richard Downing. George's former wife Moya was employed at several large hotels in Las Vegas, and used her artistic talents to paint. She endured the tragic deaths of her sons Daniel George McKnight and Patrick Ronald Salisbury when in their 40s, and the Review Journal said she "showed special strength during those difficult times." She also was fascinated by current events and politics. Moya died in Las Vegas at the age of 91 on Jan. 22, 2014. Daughter Laura McKnight (1918-2005) was born on Nov. 1, 1918 in Brownsville. She was born the very same day, and in the very same apartment building, as her future husband. She married William Curtis ("Billy Curt") Radcliffe Jr. (1915-), the son of William Charles and Adeline Stephens (McKnight) Radcliffe. They had four children -- Barbara Eileen Martin, William Walker Radcliffe, Bradford Louis Radcliffe and Beth Lynne Radcliffe. William held a bituminous miner's certificate of competency and qualification, which he obtained at the age of 23 in September 1938. Later, he "was employed in the plant protection department of Sharon Steel Corp. for 23 years," said a newspaper. He served in World War II with the Army Medical Corps. In the 1940s, the Radcliffes resided in Washington, Washington County, PA. Circa 1963, the family relocated to Ohio, and made its home in Orangeville, on Kinsman Road. William's aged parents moved into their home around that time. Suffering from black lung, William spent the last five years of his life attempting to obtain benefits, but always was turned down. He died at the age of 56 on April 27, 1975 in Trumbull Memorial Hospital. Three or four years later, he posthumously was approved for black lung benefits, and Laura began receiving monthly checks. Laura outlived her husband by three decades, making her home in Sharon and Hermitage, PA. She and her daughter Beth and grandson Brendon attended our national reunion circa 1998, and were active in organizing the McKnight Reunions from 1999-2004. Laura passed away on Nov. 11, 2005, at the age of 87. Grandson Brendon Radcliffe designed the VocalGroup.org website for the Vocal Group Hall of Fame in Sharon, Mercer County, PA. In October 2007, he married Marcia Jones, and they have one daughter Poppy Radcliffe. Their wedding photograph portrait is seen here. Marcia was a political candidate in 2013 for the elected office of treasurer in Mercer County and today serves as assistant to the chief investment officer at FNB Corporation (First National Bank of Pennsylvania). She also has been active with the "Walk a Mile in Her Shoes" event to end domestic and sexual violence, hosted by AWARE of Mercer County, and in 2013 received an ATHENA Young Professional Leadership Award. 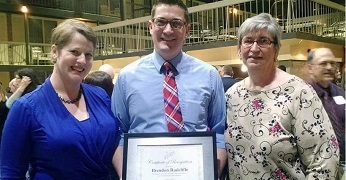 Brendon is a digital marketing manager for Mel Grata Chevrolet-Toyota in Hermitage, PA and in 2016 was named to "40 Under 40" by the Shenango Valley, Mercer Area, Greenville Area and Grove City chambers of commerce, with his name published in the Youngstown (OH) Business Journal and Sharon (PA) Herald. Daughter Lela "Kathryn" McKnight (1922-2000) was born on Aug. 2, 1922 in Dawson, Fayette County. On Nov. 25, 1942, she wed Charles Cyphert ( ? -1997) in a ceremony at St. Theresa's Church in Morgantown, Monongalia County, WV. They had five children -- Charles R. Cyphert, Patrick Francis Cyphert, David Cyphert, Greg Keith Cyphert and Robert Cyphert. Charles was self-employed and operated two coal mines -- Francis Mine in Diliner, PA and Martin Hollow Mine in Monongalia County, WV. He also owned and ran coal machinery rebuild shops in Morgantown -- Progressive Industries and Charter Engineering. Kathryn was a member of St. Luke's Roman Catholic Church and the Catholic Daughters of America. Once employed as a registered nurse, she and Charles operated a farm on Fairchance Road near Morgantown for 32 years. Charles passed away on Feb. 16, 1997. Kathryn survived him by three years. While at the 1998 McKnight Reunion in Canonsburg, Washington County, PA, she received a circle of prayer for her health. She died on July 13, 2000. She was survived by 26 grandchildren and six great-grandchildren. Her remains were interred in Beverly Hills Memorial Gardens Mausoleum. Daughter in law Debra Cyphert, married to Robert Cyphert, owns and operates Fair Play in Morgantown. They generously provided a corporate sponsorship for our 2008 reunion, celebrating "Pittsburgh 250."